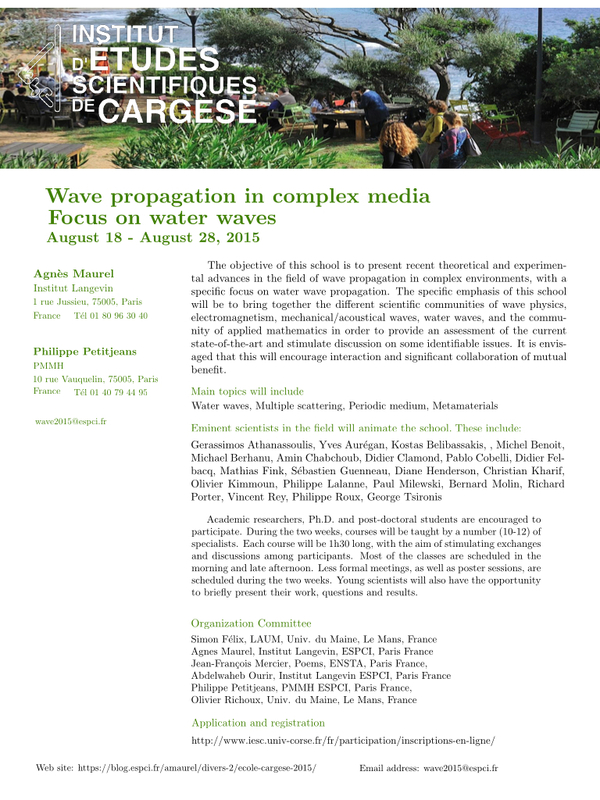 The objective of this school is to present recent theoretical and experimental advances in the field of wave propagation in complex environments, with a specific focus on water wave propagation. 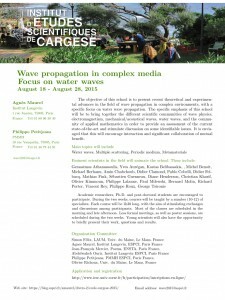 The specific emphasis of this school will be to bring together the different scientific communities of wave physics, electromagnetism, mechanical/acoustical waves, water waves, and the community of applied mathematics in order to provide an assessment of the current state-of-the-art and stimulate discussion on some identifiable issues. It is envisaged that this will encourage interaction and significant collaboration of mutual benefit. Gerassimos Athanassoulis, Yves Aurégan, Kostas Belibassakis, Michel Benoit, Michael Berhanu, Amin Chabchoub, Didier Clamond, Pablo Cobelli, Didier Felbacq, Mathias Fink, Sébastien Guenneau, Diane Henderson, Christian Kharif, Olivier Kimmoun, Philippe Lalanne, Paul Milewski, Bernard Molin, Richard Porter, Vincent Rey, Philippe Roux, George Tsironis. Academic researchers, Ph.D. and post-doctoral students are encouraged to participate. During the two weeks, courses will be taught by a number (10-12) of specialists. Each course will be 1h30 long, with the aim of stimulating exchanges and discussions among participants. Most of the classes are scheduled in the morning and late afternoon. Less formal meetings, as well as poster sessions, are scheduled during the two weeks. Young scientists will also have the opportunity to briefly present their work, questions and results. Amin Chabchoub : « The Nonlinear Schrödinger Equation and the Dynamics of Coherent Structures ». Vincent Rey : “Interference process and gravity wave focusing : application to shore protection and energy power device”. This lecture aims to give an overview of water waves and their behavior in the presence of varying bathymetries or structures. For 2-D cases, examples are given for wave reflection through interference process including Bragg resonance. For 3-D cases, examples are given for wave focusing due to a shoal or in the presence of current. Both analytical and experimental approaches including a discussion on scale effects are presented. Applications to both shore protection solutions and wave energy device are given. The institute will be held at the Institut d’Études Scientifiques de Cargèse. Cargèse is a pleasant village of considerable charm and historic interest located 50 km north of Ajaccio, on the west coast of Corsica (France). The Institute is located 2 km south of the village.